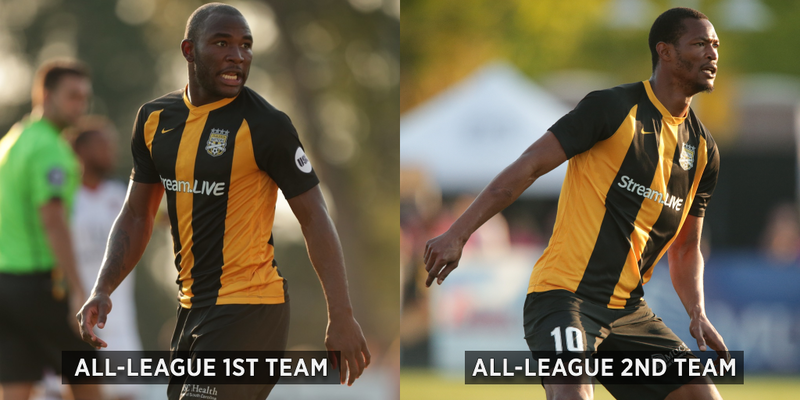 Charleston, SC - For the second consecutive season, the Charleston Battery had multiple players selected for the USL All-League teams. Tah Brian Anunga earned a spot on the First Team and Ataulla Guerra was selected to the Second Team for the 2018 season. In his second year with the Battery, Anunga put in a head turning display from the center of midfield over the course of 32 appearances. Anunga led outfield players in possession recoveries (308) and finished second in tackles won (72). The 22-year old midfielder ended the year with a team-high 82 interceptions and pitched in on the attacking end with four goals and two assists. Guerra led the way for the Battery in the attacking third in 2018, helping the Club to its 11th consecutive playoff berth. The Trinidadian forward finished the year with team-highs in goals (15), assists (5), and chances created (32). Guerra earned USL Team of the Week honors three times throughout the 2018 season and was named USL Player of the Month in July. The 2018 All-League Teams were voted on by club management and a league-wide media panel that included representation from every USL market.